Teeth whitening is one of the most popular cosmetic dental treatments, able to provide patients with brighter teeth for instantly improved smile aesthetics. Patients also enjoy a marked improvement in their self-confidence when they choose whitening treatment. White teeth have long been associated with health, wealth and success. Today, this is no different and many people are familiar with the bright smiles of celebrities, actors and models. But you don’t need to be an A-list celebrity to get a gorgeous, glowing smile as we offer amazing whitening treatments to help you achieve the red-carpet look. We offer two different types of whitening treatment, including at-home whitening and in-chair whitening at the dentist. Philips Zoom Whitening is the number one requested in-chair whitening treatment, with over 10 million patients using Zoom whitening to whiten their smile and increase their confidence. dhealth Dentistry is a trusted provider of Zoom tooth whitening technology. 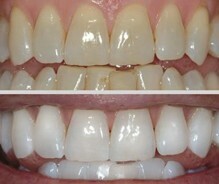 We are experts in the application of professional-strength whitening of Zoom teeth whitening. For a limited time, we are offering the Zoom tooth whitening treatment for just $595. Usually priced at $795, this special offer means you’ll receive the revolutionary in-chair whitening treatment, plus upper and lower take-home trays and a tube of top-up whitening gel for an amazing $200 less than usual. Best of all, your teeth will be up to eight shades whiter after just 45 minutes! That’s in-chair whitening at the price of just a take-home treatment! BONUS OFFER: Philips Zoom are offering a generous $50 cash back if you book your appointment before 28th Feb 2019. This reduces the total treatment cost to $545, don’t delay and book online now. At-home treatments usually involve wearing a custom-made whitening tray that contains a bleaching agent gel. Patients are advised to wear the tray for a period of time (typically two weeks) and the teeth will gradually become whiter. At-home treatments do not interfere with your daily routine and the whitening effect is accumulative, i.e. your teeth will get whiter and whiter gradually everyday until it reaches its highest/whitest potential. If you’d prefer to opt for a take home teeth whitening kit, one of these will cost you $350. In-chair professional whitening treatment achieves results very quickly, the session taking just one hour and providing impressive results. The procedure is typically painless, there is no need for any injections or anaesthetic, all you have to do is sit back and relax while whitening agent is applied to your teeth. However, small proportion of patients can experience some mild sensitivities during or after the procedure. We advise all patients to avoid icy cold food and drinks for a couple of days. But rest assured, this cold sensitivities usually subside within 24-48 hours. Should extreme sensitivities or pain occur, which is highly unlikely, relief can be found by taking some over-the-counter anti-inflammatory medication like Ibuprofen for such rare occasions. Of course we are also here to help anytime at dhealth for any concerns. We also provide the take home kit for long term maintenance with this treatment. Tooth whitening is just a simple, effective treatment for those who want to give their smile some extra sparkle! Specially designed with our patients in mind, our bespoke Whitening for Life Program helps ensure that your pearly whites stay sparkling for the long-term. Our Whitening for Life Program is simple and affordable. All you need to do is book a hygienist appointment with us every six months, and you’ll receive a free tube of take-home teeth whitening gel at each visit. Teeth whitening is not as effective if plaque or tartar is present on your teeth. So, a regular professional clean, followed by teeth whitening afterwards, is key to keeping your teeth pearly white long-term. During your six-monthly check-up, one top-up tube of Zoom take-home Whitening gel will be given to you entirely for FREE! These regular whitening top-ups will help to keep your teeth shining year after year, all at an affordable price point.